Melissa Solange is presented the chance of a lifetime. 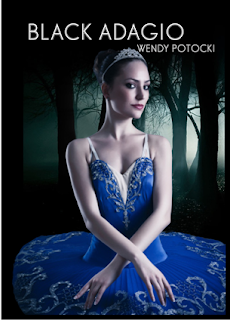 Chosen as a member of a new dance company, she works tirelessly perfecting the one element of ballet she's never mastered—the adagio. As she rehearses, a dark force watches. Resurrected by the surprise addition of a classic ballet to the repertoire, the sinister work is thought to be cursed—destroying anyone who attempts to dance it. When the production's lead dancers begin to disappear, the old warning is taken more seriously. A death worshipping cult called The Innocents is blamed, but she is not so sure. They may be the scapegoat for an ultimate evil living in the woods of Holybrook. Desperate for an answer, she searches for what lurks in the shadows of the old trees before she becomes the next victim of the Danse Macabre. Keeping track of the passengers that departed, all the stops in town were completed. The last one at the outskirts of town remained. Trying to figure out why Barbara was traveling into the middle of nowhere, he ruled out that she could be headed to the school. She wasn’t a dancer, and evening was much too late to be wandering around in the dark. Then there were those woods. It made no sense for her to be going near there. No one in their right mind would be going into that forest alone. Alone! That was it! She was going to meet someone, but why was she doing it at this time of night? Perhaps she was cheating on the man she’d left him for. If so, his heart went out to the cuckolded husband. He hated to admit it, but he could well imagine her engaging in this kind of betrayal. If she could do it to him, she was capable of doing it to anyone. Out on the open highway, the vehicle raced at a clip. Its windshield wipers batting away, the smattering of snow drove into the glass. He stepped on the gas, his car’s tires digging in. Gripping the wheel, the heat was now shooting out and thawing his frozen extremities. His thighs still tensed, it wasn’t from the cold, only the gravity of the situation. Certain that he could press them into further action, they wouldn’t fail him. He was old, but not dead. There was no way he’d miss this opportunity. His palms were sweating, his brow becoming moist. Old feelings surged up from the soul holding his sanity like fragile glass. His eyes already tearing up with regrets, he wondered if there was a promise of a future. While he was interested in hearing her explanation, what he really wanted was for her to change her mind. He was being a fool. His friends and family had told him that over and over again. Even with drumming it into his head, all his chances to be happy were let go like grains of sand from a hand opening on a beach. He didn’t want to be with anyone else. It wouldn’t be fair to pretend someone else was her. Easing down on the brake, the final stop was up ahead. Pulling to the side of road, he parked, waiting for the inevitable. Withdrawing from the car like a cobra from a basket, he wrapped his arms over his chest, beating his arms slightly for warmth. Hopping from leg to leg, the bus came to a halt. His eyes level with the passenger that emerged, he finally saw her. “Barbara!” he screamed, the sound covered by the loud rumble of the bus resuming its rounds. Spinning her head around, she met his eyes. Her face taking on an expression of fright mixed with determination, she took off for the woods. Her high boots easily cutting through the deep snow, his legs had trouble lifting, but he nonetheless tried to follow the footsteps that carved out a trail. Arms flailing from a slip, he recaptured his balance. The lip of the woods ahead, Barbara was surprisingly fleet of foot. Only a few feet ahead of him, with a tremendous effort, he shifted into a higher gear. His legs pumping forward, his arms aided in him catching up with his elusive muse. At the foot of the path leading into the forest was where he caught her. His hand groping forward, he snatched a hold of the synthetic white material, not letting go. His other hand joined in, gaining even a better hold on her wrist. Spinning her around, he stared in horror. Unable to speak, he broke the silence with a scream. 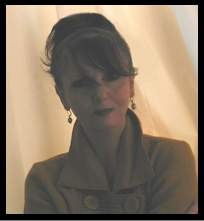 Named one of the Top Ten "New" Horror Authors by Horror Novel Reviews, she has six self-published novels. Book trailers for many of her works may be found on her official website wendypotocki.com/. Her next planned projects are Thrill, The Virgin, and ZaSo, a Gothic tale of horror. In her spare time, she loves to go for long walks, drink Starbucks Apple Chai Lattes, make devotional offerings to her cat named Persephone, and be stilled by the grace, beauty and magic of ballet.